BRITEBOX Storage Co. leads the self storage industry in Saskatoon in every category. The most noticeable is the value you receive. Our locations return an amazing value to you through our facility design for easy access, no tightly built buildings that cause many problems, and bright lights at night. Our wide driving lanes accommodate large vehicles and moving vans easily. We provide next day snow removal during those cold winter months. We provide pest control from the top industry professionals. Our staff are meticulously driven to deliver the best service in the self storage industry. The result of our hard work is the national attention we receive, from major corporations that choose BRITEBOX Storage Co. for their storage requirements in Saskatoon to local news publicly recognizing our volunteer efforts in the community. Ideal for both personal and commercial storage unit solutions, BRITEBOX Storage Co. is the facility to go and keep your belongings safe. Winner of Saskatoon's Consumers Choice Award for two consecutive years in the self storage category. We are constantly looking for new ways to expand and improve our products and services. We have the space to store locked storage containers also! Our friendly staff can find the perfect storage unit to meet your specific needs and answer any questions that you may have about our self storage facilities. Looking to increase your space at home? Mini storage units are the answer! Let us be your off-season storage garage. All of our storage agreements are easy to understand and are honest. We don't lock customers into contracts or require lengths of stay like the competition. You only pay for the days you store with us! How easy is that? Honesty and integrity in Mini Storage starts here. Make space at home or at the office with the peace of mind that everything is going to be alright! We offer many deals and offers throughout the year, including the truly $1 Move-In! Just $1 with no additional fees or requirements. You can store with us for up to one month for only $1 on our rotating selection of units. This offer truly cannot be beat. Perhaps it is easier to list everything we do as the list keeps growing! BRITEBOX Storage Co. leads the industry with a simple idea. Our staff ask themselves, what would we want and expect as a customer. It is that easy! That idea is why we have the simple lease agreements with no strict conditions on lengths of stay and NO hidden fees. That is why we have next day snow removal, we changed to super bright LED lights in our compounds to make the evening moves feel safer, we kept our wide driving lanes so moving trucks have an easier time which saves you money, and we provide our own app for easy gate access so there is no need to get out and walk to punch in your code anymore! We could go on and on, so how about you swing by for a visit or call us and we can explain more! 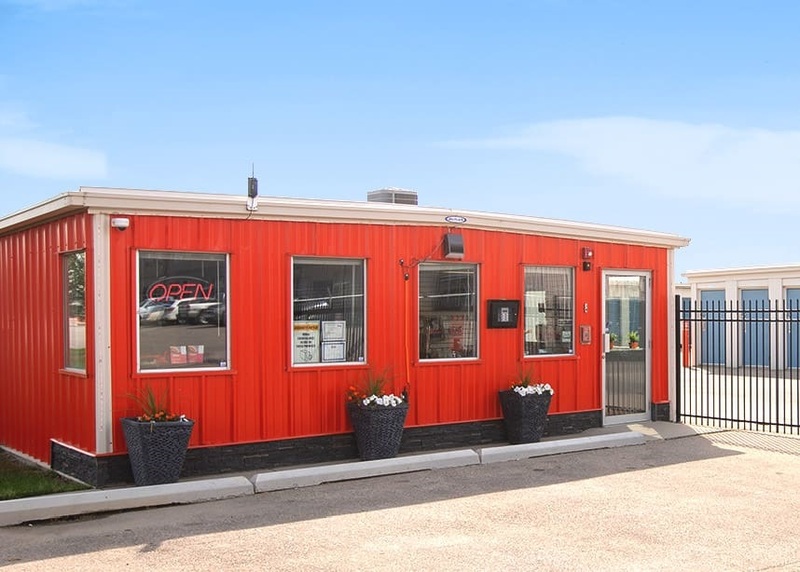 With two prime locations, we are Saskatoon's best location for car, automobile, RV and boat storage solutions. Our North End Saskatoon Storage Facility is an impressive 6 acres which includes three acres available for outdoor storage solutions located on Wanuskewin Road. We are able to provide space for mobile storage containers. For pricing on storing vehicles please call the office as vacancy fills up fast! Our facilities are within city limits, securely fenced and include professional third party pest control for the entire area. Heated and climate controlled storage units are available with drive up access. Our central location is along Circle Drive in Saskatoon. Located very close to the Saskatoon Airport, this location is great for business storage solutions. From small to large unit sizes, your storage grows with your needs with no extra fees. Airport parking is expensive, so put your vehicles in a covered locked storage unit for half the cost of airport parking! It's the safer, easier and cheaper parking option used by many frequent fliers already! Personal storage options conveniently accessible for you to drive by or visit at any time. It's like having an extra garage at home with no high costs! We have a location near you, so call us or come by to experience the difference! What's New At BRITEBOX Storage Co.
We have an app! Open the gate from your phone! We are proud to announce that we are the first and currently the only Mini Storage facility in Saskatoon to provide our amazing customers with an App that allows you to open the gate from your phone, no more getting out in the cold to punch in your code! The app is available on iOS and Android. We worked with self storage specialists PTI Security to provide a safe, secure mobile option for our customers to enjoy their experience. That's right, no more getting out of your vehicle in the bitter cold any longer! We are always growing and finding new ways to make your storage experience great! We have two brand new heated buildings up and running, they look amazing and are of exceptional quality designed by the top companies in the industry. We have brand new security systems installed at both properties to provide the safest and most secure experience. BRITEBOX accepts Apple Pay for in-store purchases, cutting edge technology! We also have the new BRITEBOX Bays, they are 11x30 heated units with motion sensing lights and electricity with two large roll-up doors on each side of the bay for easy access. Great for the small contractors or companies that need affordable space. We are continually making new things happen, and this summer has some exciting new growth at our Circle Place location so keep watching when you drive by on Circle Drive! Did you know about our BRITEBOX Storage Co. Concierge Service? It is a new service built from the ground up with you in mind. Our staff can come to you for signatures and other requirements, even payments. Our staff will also accept any shipments for you, sign for them and place them in your storage unit. We take a photo of the delivery and email you immediately. The service's ultra low cost is just an add-on to any storage space, it can be easily added on just by visiting our office and signing up. This service is available to all customers for only $25 a month! This is especially great to have during the Christmas season when you are expecting an Amazon.com delivery. Ship it to us and we can store it until you wrap it! We wanted to do moving right and we work with the absolute best moving company in Saskatoon. It took us a while to find them, but we have teamed up with All-Save Movers. These guys caught our attention because they even swept out our units after they moved a customer. They have so many years of family experience in the moving and relocation industry it is incredible. Don't waste time online searching and feeling let down. Call our office today and get in touch with All-Save Movers. There is no commitment to even store with us, we are just happy to recommend them! Moving and storage solutions done right! FREE ONLINE RESERVATIONS AVAILABLE 24/7! We are a local Saskatoon company that loves to give back to our community. We are always breaking new ground in our industry and wanting to find new ways to help Saskatoon grow! Our staff volunteers with various organizations throughout the city, all while providing the absolute best service to our great customers. Follow us on social media to keep up with our Puppy Parties and other events we dream up! *Office is located at the Wanuskewin location.